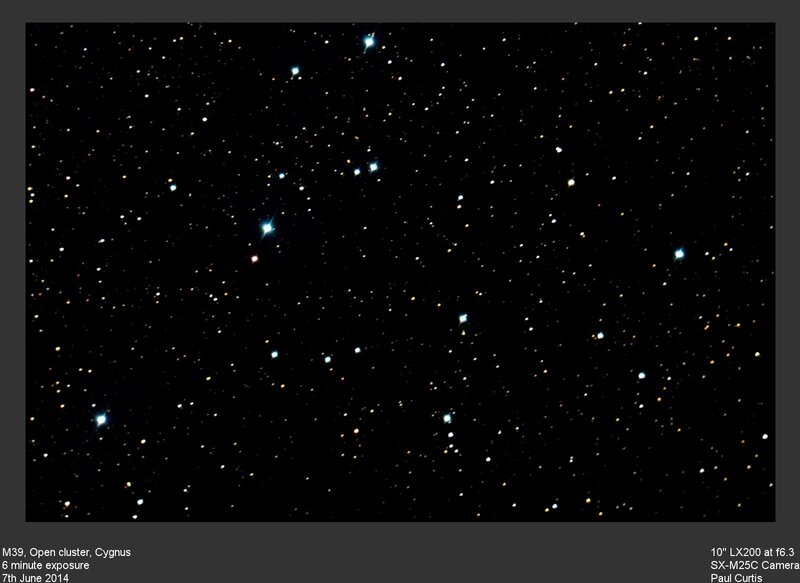 Hyades, Large open cluster in Taurus, best in binoculars. Includes the first magnitude star Alpha Taurus or Aldebaran. 55mm f2 lens guided by 10" Meade LX200 f10, Starlight Xpress MX5 CCD. Single three minute exposure. NGC884/869, Double Cluster in Perseus. 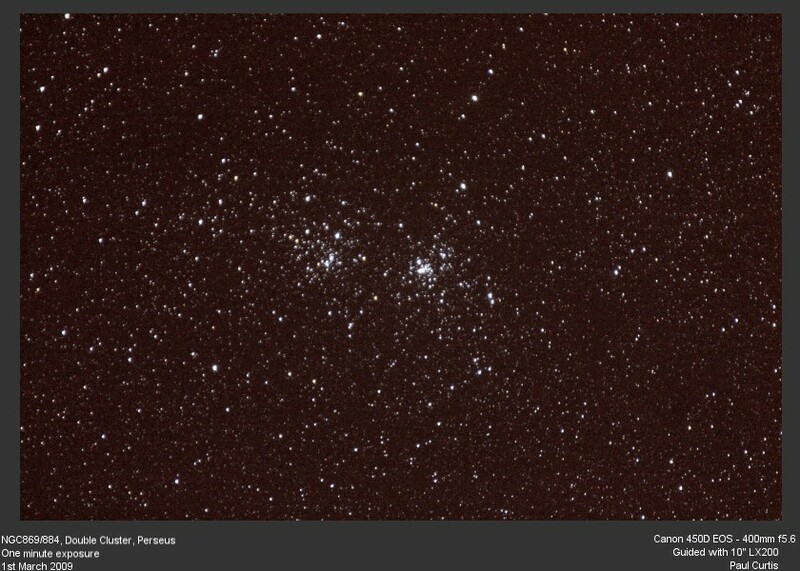 Superb pair of open clusters, magnificent at low power or through binoculars. 200mm f3.5 lens guided by 10" Meade LX200 f10, Starlight Xpress MX5 CCD. Single three minute exposure. CR399, Brocchi's Cluster (Coathangar), Vulpecula, Meade 80mm f6 APO Refractor guided by 10" Meade LX200 SCT, Modified Canon 1100D DSLR. 1 minute exposure. 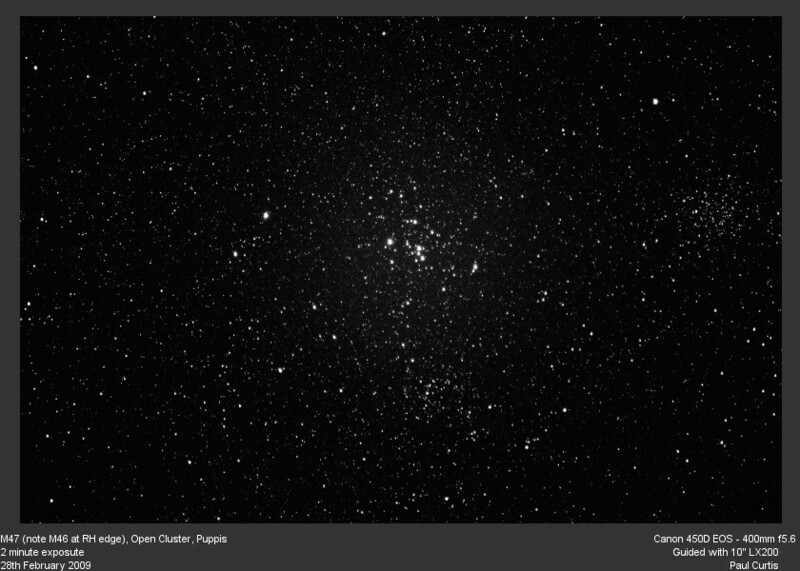 M11, Wild Duck Open Cluster in Scutum, Mag 5.8, 14'. 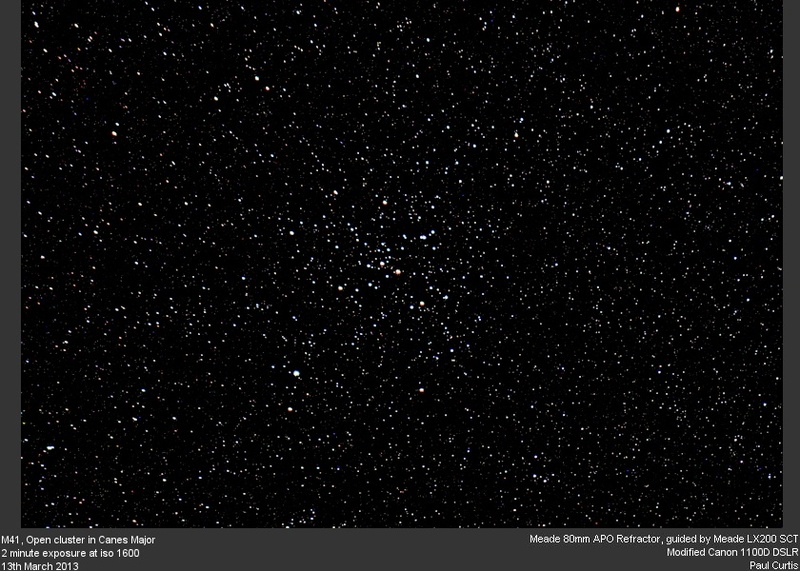 500 stars to magnitude 14, one of the best open clusters. 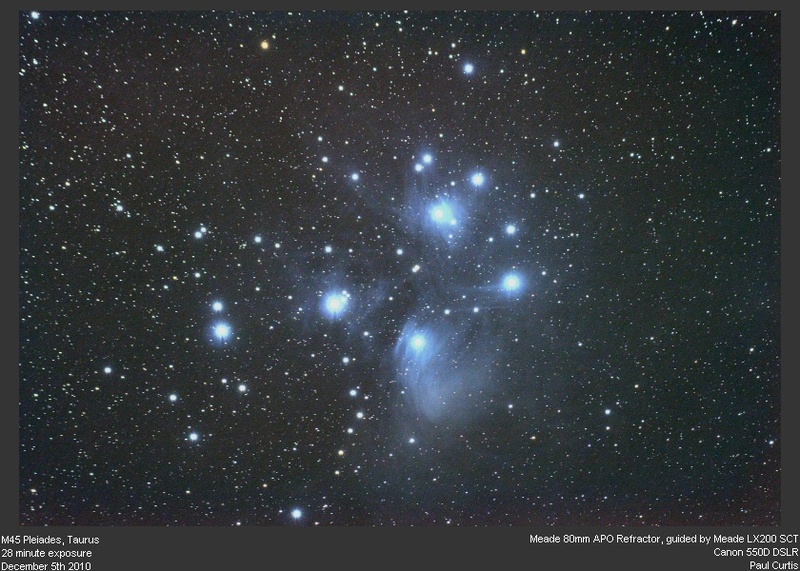 10" Meade LX200 SCT f6.3, Canon 550D EOS, Effective integration time 2 minutes. 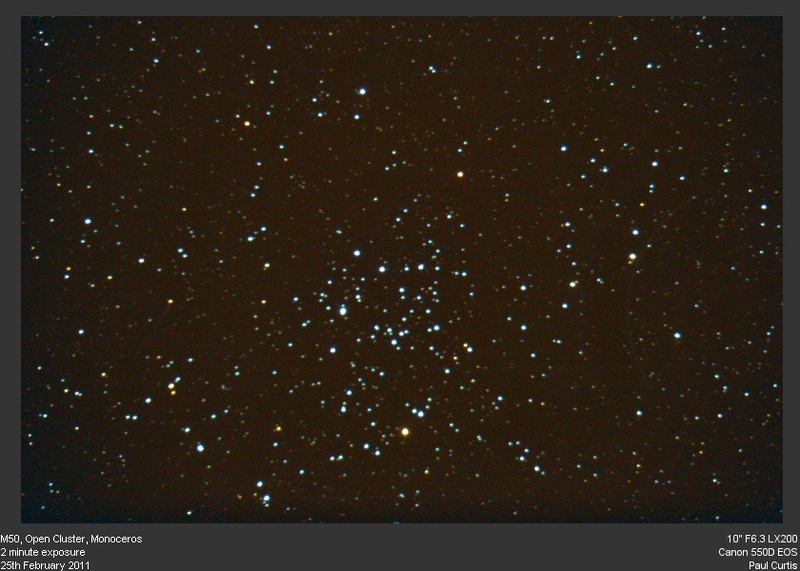 M29, Open Cluster in Cygnus, Mag 6.6, 7', 50 stars. 200mm f3.5 lens guided by 10" Orion Optics GX250 Newtonian f4.8, Starlight Xpress MX5 CCD. Integration time 2 minutes. 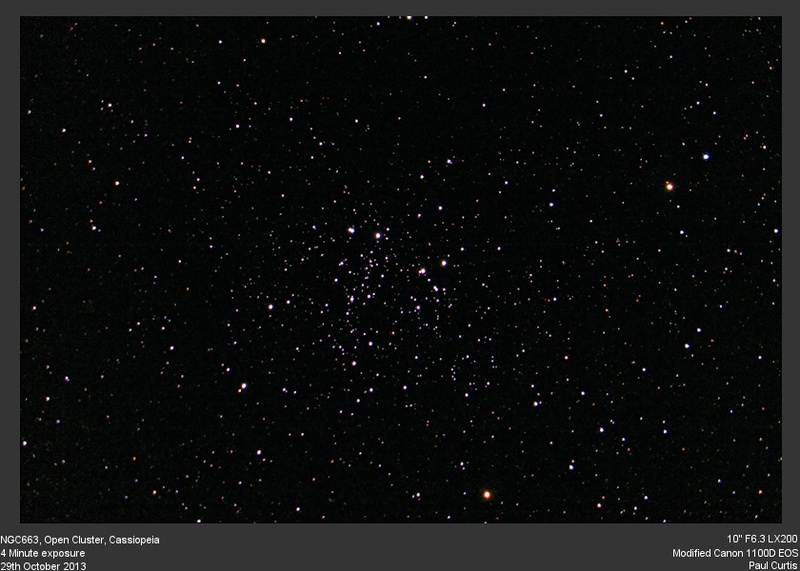 M34, Open Cluster in Perseus. Mag 5.2, 35', 100 stars. 200mm f3.5 lens guided by 10" Meade LX200 SCT f6.3, Starlight Xpress MX5 CCD. Single 3 minute exposure. M35, Open Cluster in Gemini. Mag 5.1, 28', 300 stars. Note small cluster NGC2158 30' SW - click here for close up of NGC2158. 80mm Meade APO refractor, modified Canon 1100D guided by 10" Meade LX200. Single 2 minute exposure. 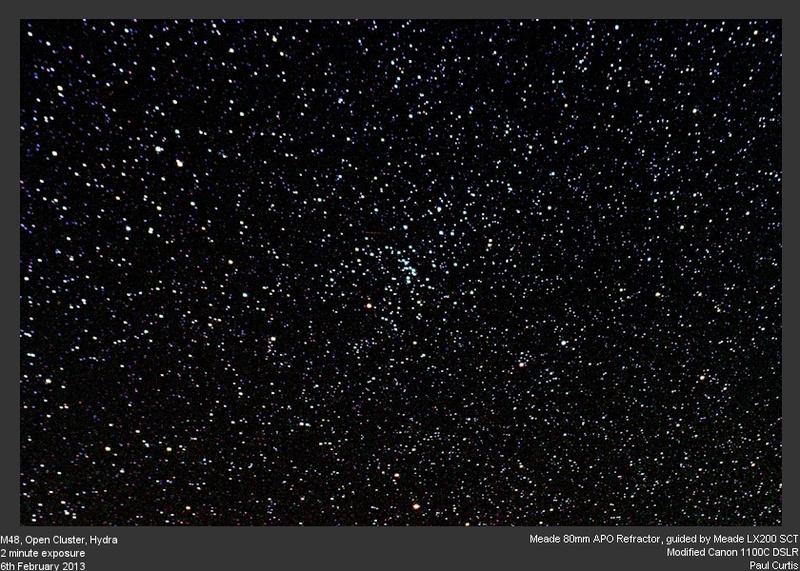 M36, Open cluster in Auriga. Mag 6, 12', 60 stars. 80mm Meade APO refractor, modified Canon 1100D guided by 10" Meade LX200. Single 2 minute exposure. For a higher magnification view click here. 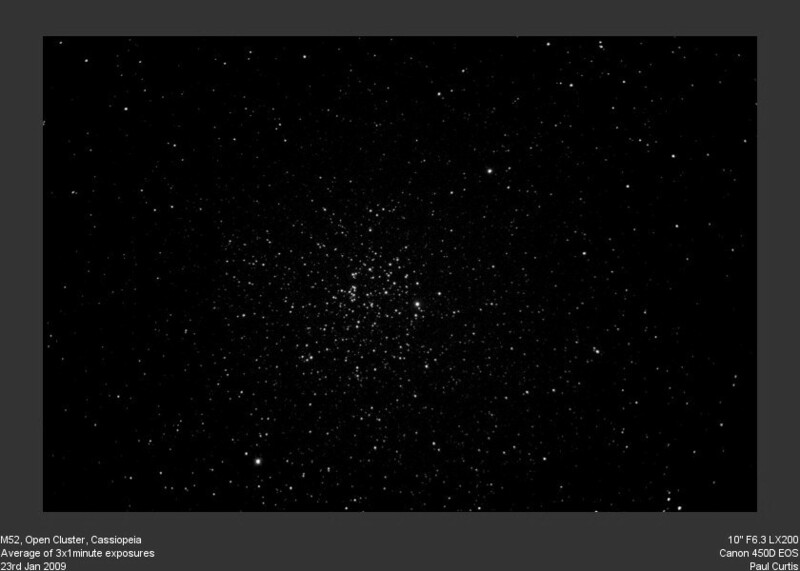 M37, Open Cluster in Auriga. 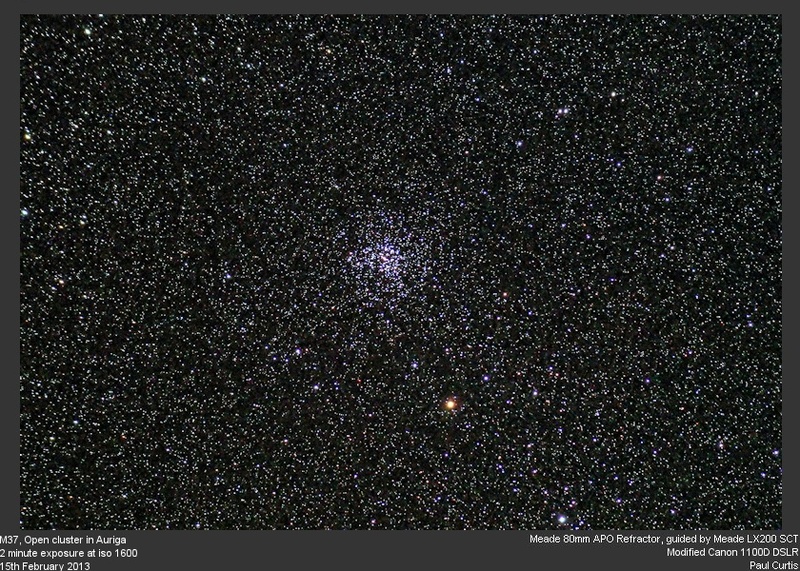 Mag 5.6, 24', magnificent cluster, 500+ stars. 80mm Meade APO refractor, modified Canon 1100D guided by 10" Meade LX200. Single 2 minute exposure.. For a higher magnification view click here. 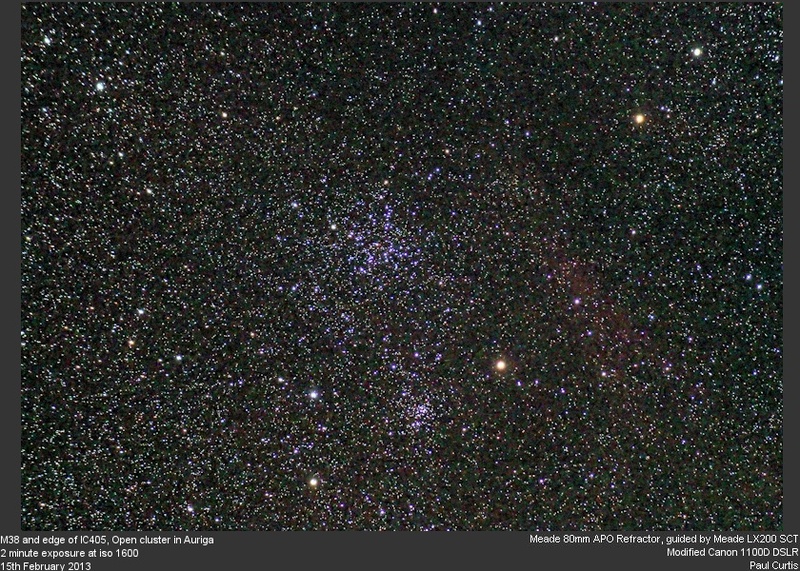 M38, Open cluster in Auriga. Mag 6.4, 21', 100 stars. Look for small nearby cluster NGC 1907. 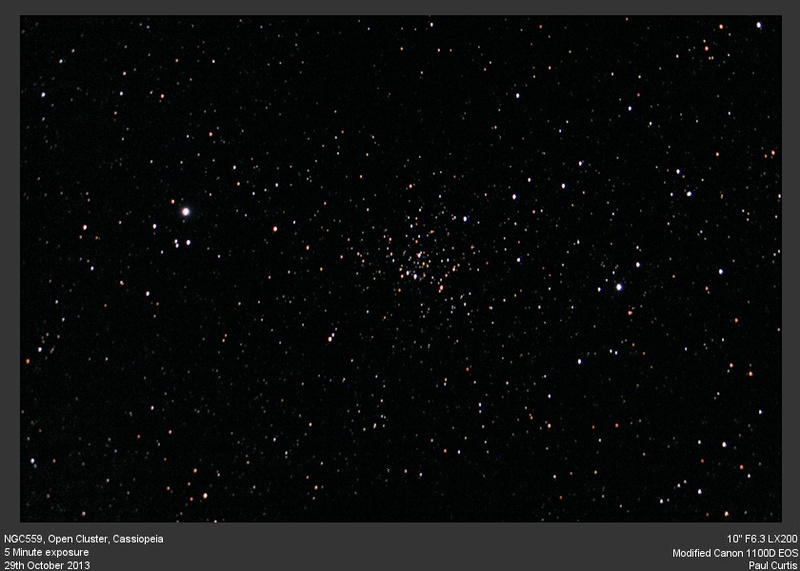 M39, Open Cluster in Cygnus, Mag 4.6, 32'. Large, bright, but just 30 true stars in the cluster. 10" Meade LX200 SCT f6.3, Starlight Xpress MX25 camera. Sum of two 3 minute exposures. Second image is wider field with 200mm f3.5 lens guided by 10" Orion Optics GX250 Newtonian f4.8. Integration time 2 minutes. M45, The Pleiades in Taurus, classic cluster. 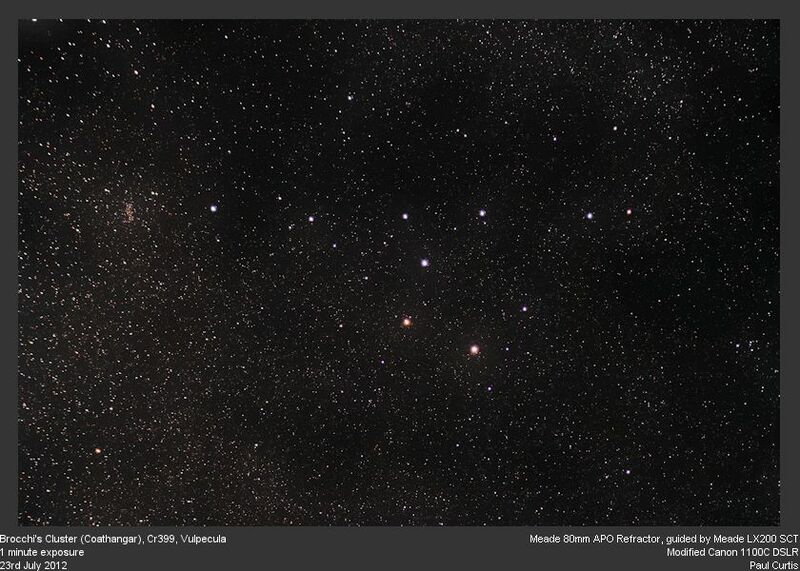 Top image - 200mm f3.5 lens guided by 10" Orion Optics GX250 f4.8, Starlight Xpress MX5 CCD. Integration time 5 minutes. Bottom image - Canon 450D EOS camera f5.6 400mm lens. Guided by 10" Meade LX200. 15 minute exposure. 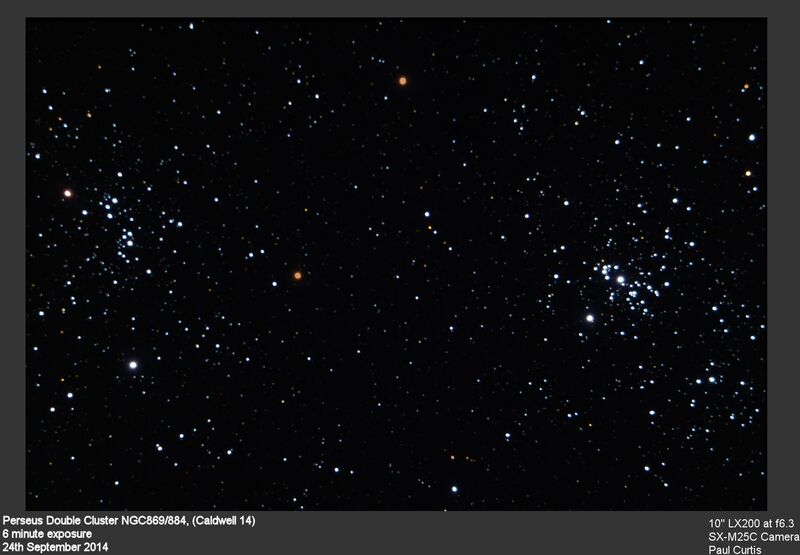 M52, Open Cluster in Cassiopeia, Mag 6.9, 13', 200 stars. - 10" Orion Optics GX250 Newtonian f4.8, Starlight Xpress MX5 CCD. Multiple exposures : Effective integration time 3 minutes. - 10" Meade LX200 SCT f4, Starlight Xpress MX5 CCD. Single 1 minute exposure. NGC2158, Open Cluster in Gemini. 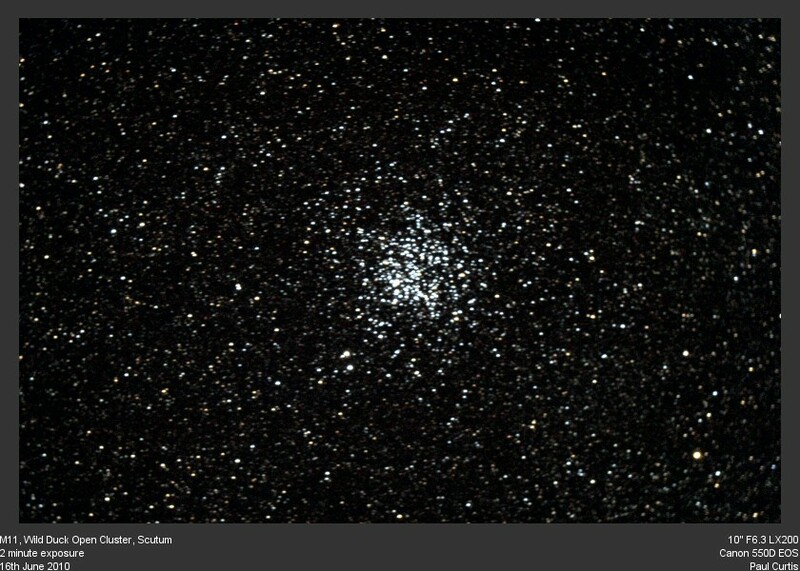 Small cluster 30' SW of M35 - try and see if you can see it and then if you can resolve any stars - it looks like a fuzzy blob by eye in my 10" scope. 10" Meade LX200 f6.3, Starlight Xpress MX5 CCD. Three exposures of 3 minutes summed to 9 minute equivalent. 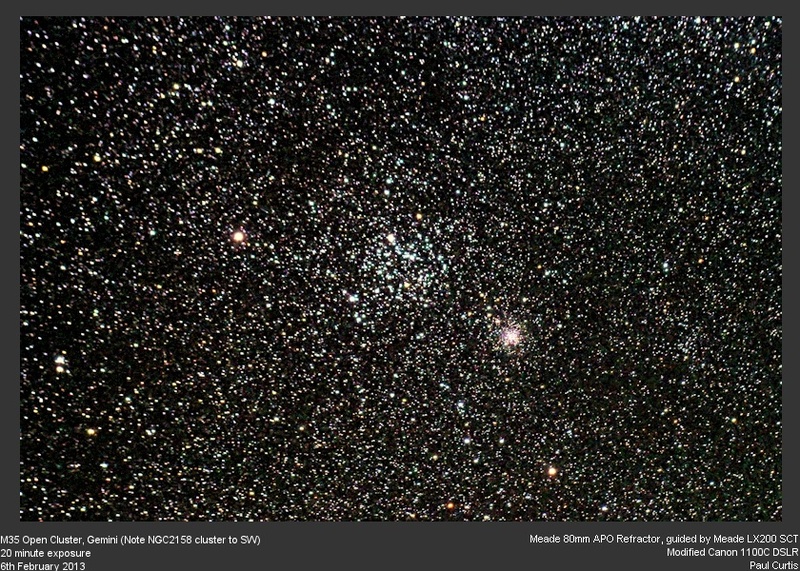 M50, Open Cluster in Monoceros, Mag 5.9, 16', 100 stars mag 9 -14. 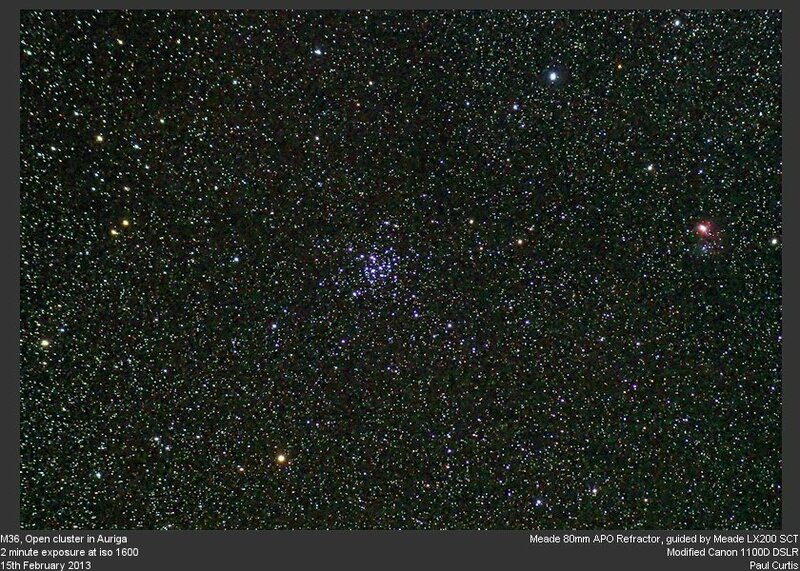 M46, Open Cluster in Puppis, Mag 6.1, 27', 150 stars mag 10 -13. 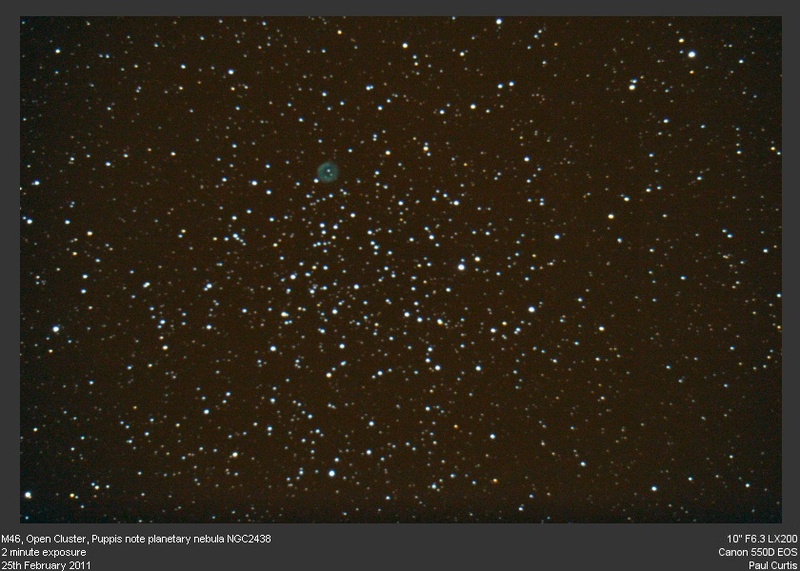 Also shows Planetary Nebula NGC2438, Mag 11.0, 1.1'. 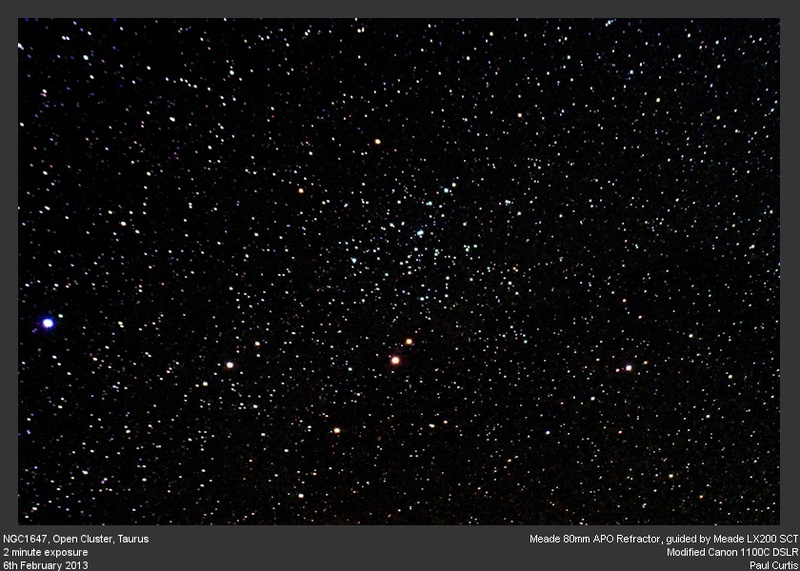 M47, Open Cluster in Puppis, Mag 4.4, 30', 30 stars bright but sparse. 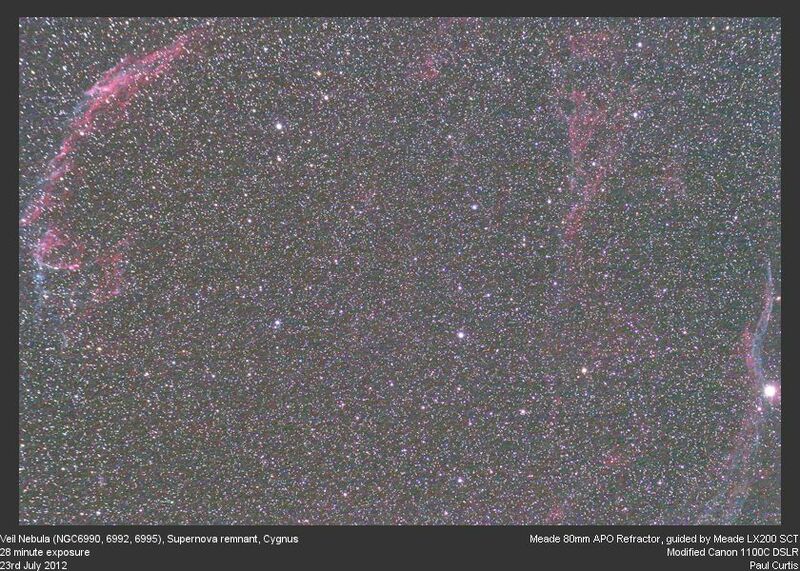 Note M46 at edge. Two double stars involved. M44, 'Beehive' Open Cluster in Cancer, Mag 3.1, 95', Best viewed at low power or with binoculars. Meade 80mm APO Refractor guided by 10" Meade LX200 SCT. Starlite Xpress Trius SX25C camera. March 2017. 25 minute exposure. M41, Open Cluster in Canis Major. Mag 4.5, 38', 150 stars. NGC559, Open cluster in Cassiopeia, Mag 9.5, 7', 60 stars. 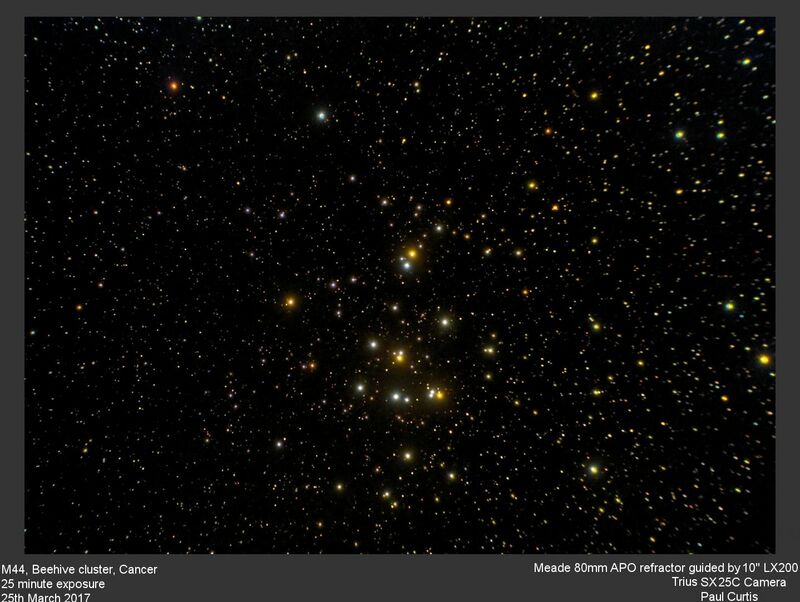 NGC663, Open cluster in Cassiopeia, Mag 7.1, 15', 80 stars.